Home / Health A-Z / What is apple cider vinegar good for? This article features 13 amazing health benefits (plus some possible side effects) of apple cider vinegar. You will also find here some practical tips on how to use apple cider vinegar as a natural cure for various health disorders and in your home as a natural cleaner. From apple must or cider, apple cider vinegar is usually made. Amber is the color of apple cider vinegar. Mother of vinegar (a substance that develops on the fermentation of alcoholic liquids and is made of acetic acid and cellulose) is present in apple cider vinegar. The vinegar looks like a solidifying structure and in appearance, it is just like a cob-web. Apple cider vinegar has a number of uses. Food preservatives, salads, vinaigrettes, and making chutneys are just some of its uses. To make apple cider vinegar, first of all, the apples are compressed and liquid is extracted from them. After that, the alcoholic fermentation process is started by putting yeast and bacteria into the liquid. After that, alcohol is made from the sugar. After this, another fermentation process is carried out. In this process, the bacteria which form acetic acid are changed into vinegar. Due to the presence of acetic acid and malic acid, the taste of apple cider vinegar is sour. When it comes to the benefits of apple cider vinegar, you need to know that it has many benefits. For cooking purposes and general house use, vinegar has been used for quite some time now. 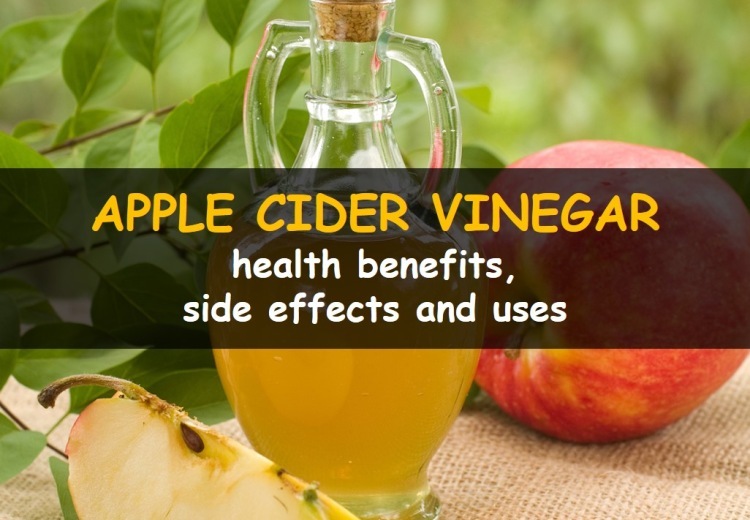 Many health problems can be sorted with the help of apple cider vinegar. There is scientific evidence behind the fact that apple cider vinegar is beneficial for the body. Some benefits of apple cider vinegar for the body include its benefit in lowering blood pressure and its weight loss effects. ‘Mother vinegar’ is present in apple cider vinegar. According to some experts, apple cider vinegar has many health effects due to the presence of ‘mother vinegar’. In one table spoon of apple cider vinegar, there are only 3 calories. Now this amount is very low in comparison to other vinegars. Tiny amount of potassium are present in vinegar, but no other minerals or vitamins are present in it. Antioxidants and amino acids are also present in good apple cider vinegar. Bacteria and some other pathogens can be killed by apple cider vinegar. For ear infections, fungus, and disinfecting and cleaning, apple cider vinegar is used. The downside of this, however, is that there isn’t enough research done so far to prove these effects. Apple cider vinegar has been used since ancient times. You might be surprised to know that for cleaning the wounds, apple cider vinegar was used by the father of modern medicine named Hippocrates (a Greek physician named Pericles). Research has shown that vinegar provides protection against antibacterial effects on the foods on which bacteria is present (1). So you should choose apple cider vinegar if you want to protect your food for longer durations of time. Also, against the bacteria which gather on the skin, apple cider vinegar is quite useful. In treating type 2 diabetes, apple cider vinegar is quite useful. The blood sugar levels are increased in type 2 diabetes. A person is affected by type 2 diabetes when insulin can’t be produced in the body. In people who don’t have diabetes, elevated blood sugar can also provide damage. Some chronic diseases can be caused when the blood sugar level in the body is high. So keeping blood sugar to a balanced level isn’t only beneficial for diabetic patients; it is helpful for everyone. When a person doesn’t use refined sugar and carbohydrates, blood sugar level is kept at normal level; using apple cider vinegar is another way to keep blood sugar levels under control. There are many benefits of apple cider vinegar for blood sugar. A study recently conducted by Johnston and his colleagues, proved that, in people who have type 2 diabetes, insulin sensitivity can be increased by adding vinegar to the diet (2). Also, the fasting blood sugar can also be decreased by the use of vinegar. Another study proved that when vinegar is taken with food, its antiglycemic properties become prominent (3). So for people who want have diabetes and want to keep their blood sugar levels at normal rate, apple cider vinegar is quite helpful. A precaution which you need to take care of is that you should consult the doctor before taking apple cider vinegar, in case you are already taking too much medications. For weight loss, apple cider vinegar is quite beneficial. You can lose the fats from your body because apple cider vinegar give you a feeling of fullness. In this way, a person consumes less calories. Satiety feelings can be produced by vinegar and make a person eat fewer calories (4). So if a person consistently takes vinegar with meals, he will lose weight. A Japanese study was recently conducted which proved that in fat people, the use of vinegar can reduce body mass and body weight (5). This study went on for a period of about 2 weeks, which proves that vinegar gradually effects the body. Basically, what you need to understand is that vinegar doesn’t have magical effects because no single food can dramatically change your weight. Combination of different foods can help in weight loss. But adding vinegar increases the chances of weight loss. Apple cider vinegar is quite beneficial for heart health. Today, the biggest cause of death are the cardiovascular diseases. When a person gets a cardiovascular disease, many factors work together to cause it. It has been shown through research that the use of vinegar decreases these risk factors. However, the problem with these researches and studies is that all of them have been done on rats, not on humans. In one of these studies, it was proved that rats which were provided with a high cholesterol diet had a reduction in their triglyceride levels and the cholesterol levels (6). Chlorogenic acid is present in vinegar. Through this acid, the oxidation of LDL cholesterol is stopped. In rats, the use of vinegar also lowers the blood pressure, according to some studies. These are all rat studies and the fact of the matter is that what works on rats might not work on humans. One human study was published in 1999. In the study, it was proved that women who intake vinegar have a lower risk of heart diseases (7). However, this research is far from conclusive because it only shows an association. Apple cider vinegar has proven its worth against candida. You should first know what candida is. It is actually a parasitic bacteria, which is helpful against yeast infections and digestion. Poor diet usually leads to candida, especially when the carbohydrates and sugar content in the diet is quite high. Other than this, during birth control, too, candida can occur. If you want to get rid of candida, you should always have vinegar with you. Also, for killing molds and foot fungus, vinegar is quite beneficial. If you have digestive problems, mix apple cider vinegar with water and drink the solution. Most digestive problems are caused by bacteria and due to the antibiotic properties of apple cider vinegar, it is quite beneficial. Against intestinal problems, apple cider vinegar is quite beneficial due to the presence of pectin in it. Everyone knows that cancer is quite a severe disease. In this disease, the ‘rebel cells’ in the body keep on growing in numbers. You will find tons of websites on the internet stating that apple cider vinegar helps with cancer. But let us see whether studies support it or not. A study, conducted in 2004, proved that vinegar leads to a reduction in the increase of cancerous cells and tumors in the body (8). This study wasn’t done on any subject; it was just conducted on rice. Therefore, the results of this study are inconclusive. Other than this study, there are other studies which prove that apple cider vinegar is beneficial against cancer, however, all these studies have been done on rice, test tubes and rats. On humans, some observational studies were conducted. These studies showed that in some countries, vinegar increases the risk of bladder cancer, whereas in some other countries like China, it decreases the risks of esophageal cancer. So the bottom line is that apple cider vinegar has anti-cancerous properties because some researches have been done on rice and rats which prove that it is beneficial for cancer. But it is too early to say that to what extent apple cider vinegar gives protection against cancer. If you want to clean your house, vinegar is quite beneficial. There are many commercially prepared vinegar solutions present in the market. However, you might be surprised to know that this commercially prepared vinegar is less beneficial than raw vinegar. Just combine apple cider vinegar with water and get its benefits. Its smell is not unpleasant and it will cost you less as compared to other cleansing products. To use apple cider vinegar as an antibacterial spray in kitchens and bathrooms, simply mix it with a few drops of thieves’ oil. In dandruff, the bacteria accumulate on the hair. Apple cider vinegar contains some powerful enzymes in it which eliminate the bacteria causing dandruff. Moreover, it is highly acidic, which is also helpful against dandruff. Due to apple cider vinegar, the levels of natural oils in the hair is raised. This is quite beneficial for a healthier head. To apply apple cider vinegar on your hair, just put some of it on your hair and mix it thoroughly in your hair, just like shampoo. After that, let it rest for a few hours and then wash your hair. 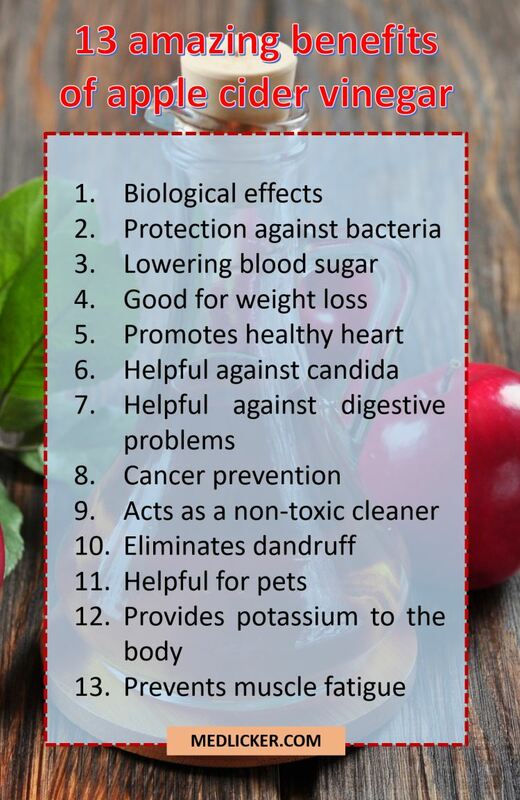 Apple cider vinegar is quite beneficial for pets, especially dogs. Sometimes, fleas accumulate on the skin of a dog. Against these fleas, apple cider vinegar is quite beneficial. After applying apple cider vinegar on your pet, you shouldn’t worry because there are no harmful effects of using this vinegar. Apple cider vinegar keeps the pests and microbes away from your pet’s body. Another good idea is to add this vinegar in the food of your pet. Due to this different allergies will be prevented. Here you should adopt the precaution of not giving too much vinegar to the dog. 2 tbsp per day with food for a dog is enough. Potassium is quite beneficial for the body. It keeps the tissues flexible and helps in their maintenance. Many health problems can be caused when the body doesn’t get enough potassium. Severe nerve and muscle problems can be caused when there is a slight difference in the levels of potassium. Low levels of potassium can be caused due to a number of reasons like diarrhea, sweating and dehydration. Whatever the reason may be, it is important to keep the potassium levels up to their normal level. The best way and probably one of the easiest way to intake potassium is by drinking a glass of water mixed with apple cider vinegar. When there are less minerals in the body, muscle fatigue is caused. Usually bodybuilders suffer from muscle fatigue. To increase the mineral levels in the body before exercise, take a table spoon of apple cider vinegar. Research also supports that apple cider vinegar should be taken as a dietary beverage to help with muscle fatigue (9). When vinegar is consumed, the essential minerals come into the body, which balances the pH in the body, due to which lactic acid is eliminated from the body. Apple cider vinegar is highly acidic. The throat of a person can become sore due to the acid present in it. So you need to do something which makes the apple cider vinegar easier to consume. It is a good idea to mix it with water. If your throat still becomes sore, contact your doctor. Disturbances can be caused in the stomach or esophagus when apple cider vinegar is consumed in the form of liquid or supplement. According to the latest researches, damage can be caused to the stomach or esophagus due to the strong acid present in vinegar. Other than this, irritation on the skin and rashes can be caused when apple cider vinegar is applied to the skin. So it is a good idea to mix apple cider vinegar with honey or water to avoid any complications. With some drugs like diuretics and insulin, apple cider vinegar can react due to its acidic nature. The level of potassium in the body can drop to a great level and sometimes, hypokalemia (potassium deficiency in the body) can be caused due to large consumption of apple cider vinegar. With diabetic and blood pressure medications, apple cider vinegar can prove dangerous because it can affect the blood sugar and insulin level in the body. So, you should consult your doctor before taking apple cider vinegar, if you are already taking other medications. When consumed through the oral route, apple cider vinegar can cause damage to the tooth enamel. It increases the sensitivity of the teeth and make them yellow. So if your teeth have gotten yellow due to apple cider vinegar, you should use a straw for consuming it. To avoid side effects, mix apple cider vinegar with water or juice. Also, always brush your teeth after intake of apple cider vinegar. You will feel the symptoms of nausea after consuming apple cider vinegar, although you might not vomit afterwards. You need to keep on changing the time of the consumption of apple cider vinegar until you get the right fit for your body. Also, never take apple cider vinegar when your stomach is empty. Apple cider vinegar detoxifies the body. Due to this, after the consumption of apple cider vinegar, headache can be caused. The headaches will go on for two or three weeks. However, there is no need to panic as they will be mild. Stop using apple cider vinegar if you suffer from severe headache. One of the health benefits of apple cider vinegar is that it can be used to remove dandruff. There are many sprays available in the market but they are costly. So you should use apple cider vinegar. To use apple cider vinegar for removing dandruff, in a spray bottle, mix apple cider vinegar and water. You should use one-fourth part of each of them. Now apply the spray on your hair. Let it remain there for about 15 minutes and after that, wash your hair. If you use this spray bottle twice every week, you will get rid of dandruff quickly. Apple cider vinegar can also be used for sore throats. For using apple cider vinegar to relive sore throat, take a glass of water and put three teaspoons of honey, one tea spoon cayenne pepper and one tea spoon apple cider vinegar in it, and mix it thoroughly. As all of these ingredients have healing effect, your sore throat will heal in no time. To eliminate bad odor from foot, you should use apple cider vinegar. To use apple cider vinegar for eliminating foot odor, take some paper towels and pour apple cider vinegar on it. Put them in a fridge for a night and then put it in a zip-lock bag. Due to this, the pH level of apple cider vinegar will be changed. This will kill the bacteria on the feet. If you face digestive problems, you should use apple cider vinegar. For using apple cider vinegar for fight digestive issues, mix one table spoon of apple cider vinegar with water. You can drink it before or after a meal. Constipation and diarrhea can be fought through apple cider vinegar. If you suffer from heartburn, you can also take apple cider vinegar. Your skin can benefit greatly from apple cider vinegar. To use apple cider for healing sunburns, take it in liquid form. Now put a washcloth in it and apply it on your skin and face. When the oil is absorbed, your skin will become smooth and wrinkles will be reduced. Apple cider vinegar balances the pH levels of your skin. Another thing which you can do is that you can put apple cider vinegar on your face and sleep with it. It will reduce the age spots and pimples of your skin. Apple cider vinegar has lots of benefits. It may help you deal with candida, dandruff, it promotes weight loss and heart health. However there are also some risks associated with ACV use, such as damage to tooth enamel or throat tissue "burns". It may also interact with other medication you take so you should definitely ask your doctor before attempting to use apple cider vinegar as a home remedy.